Explore one of the lesser known National Parks in South America. Tayrona National Park is located in the north of Colombia, along the Caribbean coast at the foot of the Sierra Nevada de Santa Marta. We discover the area by trekking through the national park, visiting prehistoric sites, spotting colourful birds and relaxing on the white sands of the beach, hidden in the park itself. The dry season in Colombia roughly runs from December to March/April and also a slightly 'dryer' period from July to September. These are among the best times to travel, although visits outside of these months are very manageable. The Caribbean coast is very hot and humid all year round (always around or above 30°C), although the offshore breeze between December and March makes this a more popular time to visit. Due to the high altitude locations of places like Bogota, Manizales and Armenia temperatures here can be quite cool during 'winter' months (Nov to Mar/ Apr) and the nights are cool to cold at anytime of the year. The coffee harvest seasons are March to May and September to November; it is during these periods that it is possible to see the red coffee beans and watch the whole process of coffee production. Prices based on full day excursions with 2 persons - for larger groups prices will be lower. Lightweight clothing is essential though a warmer sweater is advisable for cooler evenings. A waterproof is essential. Long trousers and long-sleeved shirts are recommended on jungle walks. Comfortable hiking boots/trekking shoes, shoes and/or sandals. A torch, water bottle, good quality sunglasses, sun hat, insect repellent and high factor sunscreen are all essential. Local Crew: Although entirely voluntary, tipping is a recognized part of life in this region of the world. Some local staff will look to members of the group for personal recognition of particular services provided. Accordingly you should allow approx. US$20 for gratuities for local staff. 10% is expected in restaurants. None for UK citizens, Canadian citizens have an entry tax of 68US$. Your tour leader can also advise you on arrival. Most major hotels, restaurants and stores accept credit cards. Villa Maria is an original colonial house, with surrounding bamboo villas where the rooms are located. A suspension bridge connects the villas to the restaurant, protecting the original stone path and Indian stone idol set in a giant rock. All the villas are unique, providing the feel of nature, as well as air conditioning, hot water, private bathooms and views of the sea or jungle. Columbia: Visas are not required for UK, New Zealand, Australian, US and Canadian citizens. We recommend protection against malaria, Tetanus, Infectious Hepatitis, Typhoid and Polio. Please consult your travel clinic for the latest advice on Malaria, Dengue and Zika Virus. Please take preventative measures to avoid mosquito bites - these include mosquito repellent as well as long trousers and long sleeve shirts to cover up when necessary. Please note many countries in Central America, South America and the Caribbean require a yellow fever vaccination certificates if travelling from infected areas. A detailed list of these countries can be found on the NaTHNaC website - http://travelhealthpro.org.uk/countries. Also on the NaTHNaC site there is a list of Countries (and specific areas within a country) which are at risk of infection and a vaccination is therefore recommended. Please check the latest requirements with your travel clinic or doctor prior to departure. The above is not an exhaustive list. Further information regarding vaccinations and travel health advice can be found by following the NHS and NaTHNaC links at Explore Travel Health and from your local healthcare provider. Visa and vaccination requirements are subject to change and should be confirmed by you before travelling. 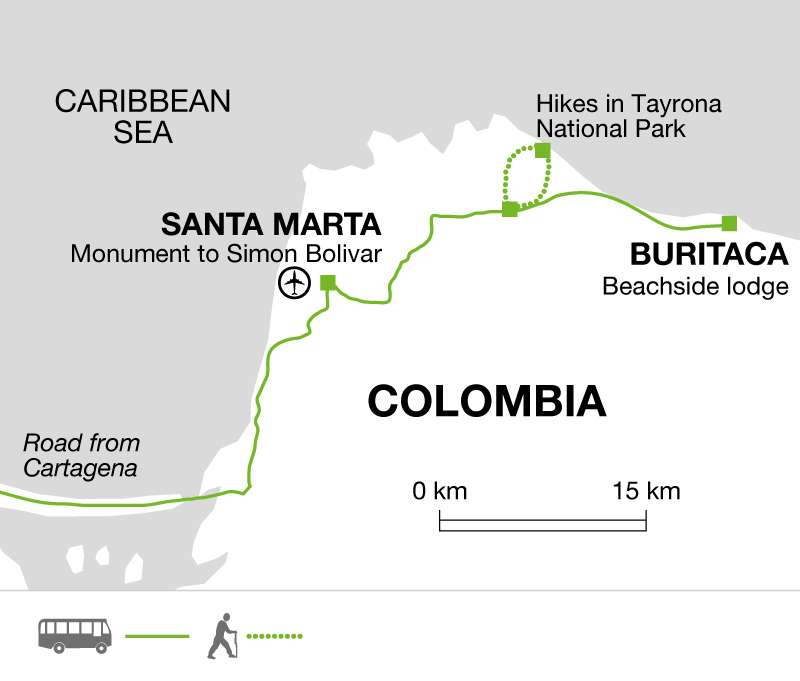 This trip is a great way to extend a number of South America trips, offering the perfect combination of trekking and beach in this lesser-known area of Colombia.